The dogs romping around the dozen or so cross-country skiers Sunday ranged in size from a tiny Jack Russell and Yorkie mix named Bandit to a Catahoula named CJ. Bandit, a newcomer to skijoring – a sport in which dogs are harnessed to their owners and help pull them while they ski – trotted beside his owner while a tether dangled loosely between them. CJ, who has two years of skijoring experience under her collar, had no problem pulling her owner across the trails. 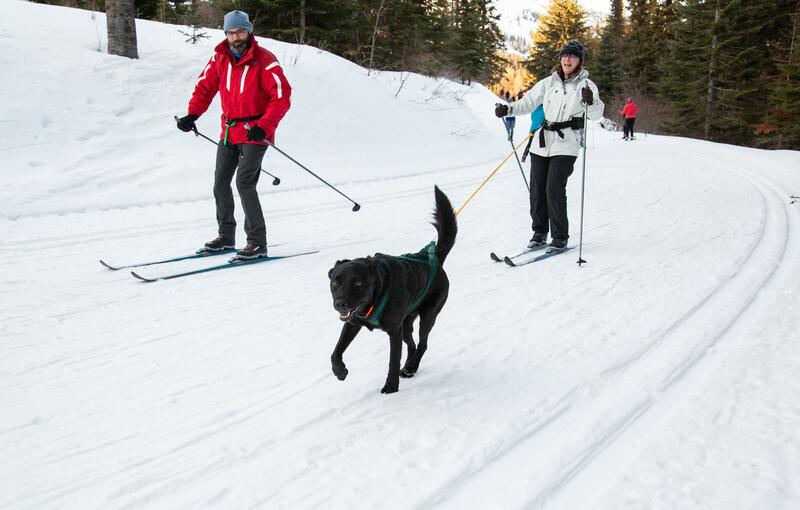 Her owner, Laura Kier, one of the volunteer instructors at the Spokane Nordic Ski Association’s annual Winterfest event, said CJ took to skijoring naturally when she and her husband, Rich, brought the dog to a ski clinic in 2016. Rich Kier said that skijoring, one of several cross-country skiing clinics taught at Winterfest, solidifies the bond between owners and their dogs. The dogs do some of the pulling, but much of the work is done by the skiers themselves. Diana Roberts, the lead instructor at the Skijor Winterfest clinic, said any size of dog can participate. She said racers usually have large dogs that can handle high speeds and weight, but small dogs often enjoy running in the snow in front of their owners as well. She said her physical therapist has a 22-pound dog that loves running in the snow. Roberts said she and and her Great Dane, named Murungu, were among the skijoring pioneers on Mount Spokane. She said skijoring, which translates to ski driving in Norwegian, is a way people and animals can get outside and exercise together. Skijoring was one of several activities available at Winterfest on Sunday. Several ski chairs, which are designed to allow people with disabilities to participate in winter sports, were available for an afternoon clinic as well. Kacie Dietz, a recreational therapist with Inland Northwest Adaptive, said the ski chairs were available to try out, but their goal was also to educate people on trail etiquette. She said skiing in a chair can be difficult to get used to. Skiers have difficulties moving out of a track or stopping, so a skier in a chair always has the right of way on a trail. She said people in ski chairs usually have guides who can assist them if they’re vision impaired or have mobility issues. She said sometimes a guide, who is also skiing, is tethered to a person in the ski chair and can intervene if there is an issue while skiing. Dietz said she also works for Team St. Luke’s, which works to make sports from water skiing to archery accessible to allow people with any ability level to participate in sports. Winterfest Organizer Brad Thiessen said 92 people, from beginners to experienced skiers looking to try something new, signed up for lessons Sunday. He said skijoring is a niche sport for now, but it’s growing in popularity. Published: Jan. 13, 2019, 8:12 p.m. Updated: Jan. 13, 2019, 10:21 p.m.